For sheds, fences and garden furniture both new and previously treated. A water based, quick drying, low odour product, with UV protection and high water repellency. Protects for up to 5 years. Can be recoated after 2 hours in good conditions. Approx coverage 6-12m2 dependant on surface. 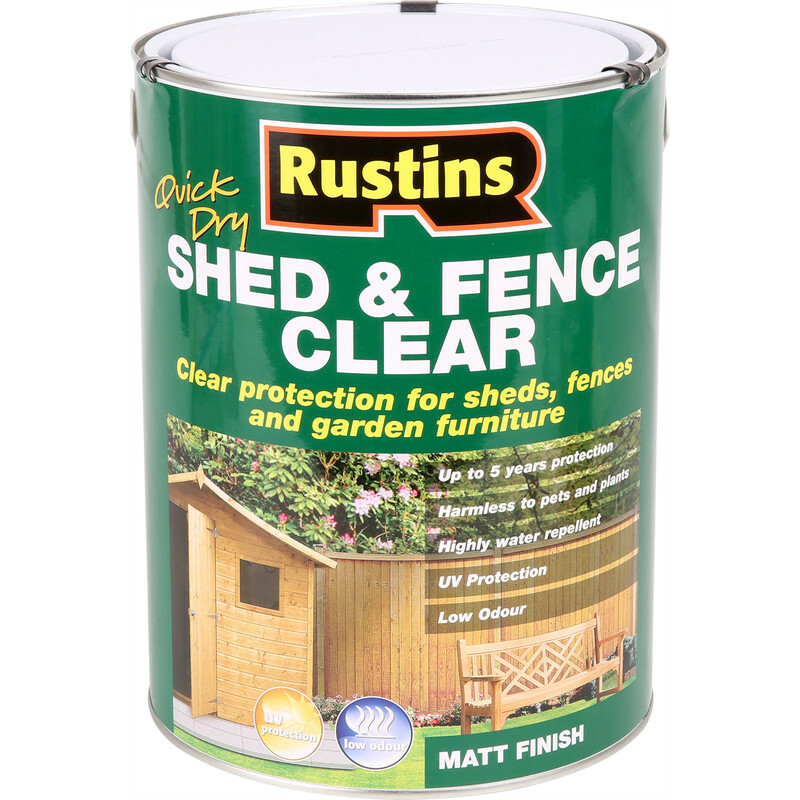 Rustins Quick Dry Shed & Fence Clear Protector 5L is rated 4.4 out of 5 by 10. Rated 3 out of 5 by Gordy5 from Decent Used it as a quick way to seal wood preservative on summer house floor. 3 weeks in and it seems up to the job. Time will tell. Rated 5 out of 5 by Bee2 from Did the job. I wanted to keep the natural colour of my garden fence, so was pleased to find this clear wood protector. Once it has dried you can’t tell the difference between before and after. Also it’s less messy being clear as random splashes and drops don’t show up. However, my fence was long overdue for this treatment and the square coverage was less than what is says on the tin. Rated 5 out of 5 by Nigelph from Covers well, easy to apply I bought this to treat the inside of a newly built log cabin where I wanted to seal and protect the wood but still have the natural colour. It appears to have done exactly that, leaving a nice smooth matt finish. No smell, and brushes wash out in water. Rated 5 out of 5 by Beadsman from Does as it says on the tin!!! Easy to use, effective, and competitively priced. Couldn't ask for more!! Rated 3 out of 5 by Mart IV from Time will tell! I used this on rough sawn exterior cladding, it has left a 'bleached' effect, which hopefully will weather. This is disappointing as I had hoped this would bring out the wood grain, so fingers crossed, as would be a waste of time to paint again or finish with another product as suggested by another reviewer. Rated 5 out of 5 by Banksy boy from Great product I used this to give my ply lined garage a coat.lt is really easy to apply and clean up is easy as it’s water based also no smell.